DETAILS: A bright and beachy gulf-front WaterColor condo with incredible coastal views! This beautiful home features three bedrooms, four bathrooms, and sleeping accommodations for eight guests. The first level of this home offers a spacious floorplan and lots of natural light from the windows surrounding the main living area. The kitchen is well-appointed with exquisite granite countertops, stainless steel appliances, and ample cabinet space. The adjoining dining room offers a large dining table and seating for eight guests, with an additional three seats at the breakfast bar. The living room boasts lots of comfortable seating, beautiful coastal décor, and a large flat-screen television. Two sets of French doors lead to the main-level balcony, which offers a sitting area and breathtaking beach views. Also on the first floor is a queen bed guestroom and private bathroom with a glass-front shower and single vanity. Guests in this room will enjoy the balcony access directly from the room’s French doors. On the second floor are two additional guestrooms. The master suite features a beautiful king bed, two comfortable armchairs, a private balcony with gulf views, and an en suite private bathroom with double sinks, a shower, and a separate spa tub. The second guest room on this level offers two luxurious queen beds, a large flat-screen television, and a private bathroom with a single vanity and shower. This beautiful gulf-front home offers stunning coastal views, perfect for morning coffee or evening cocktails on the home’s lovely balcony areas. Enjoy a day of fun and sun on the sugar white sand beach, which is easily and quickly accessible via the dune walkover near the home’s front door. This home also features access to a separate, private condo pool nearby, as well as three custom 360 Blue adult beach cruiser bikes—perfect for exploring our idyllic coastal towns along 30A. 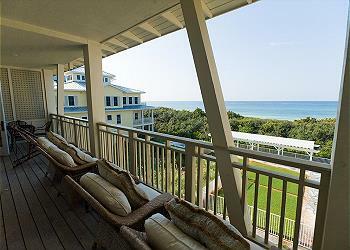 Your dream 30A vacation awaits! Experience all that the emerald coast has to offer—contact 360 Blue today to book your getaway in this incredible beach-front home! Weddings are not allowed at this home. If this policy is violated, you may be asked to vacate the property and forfeit any rental payments as well as be subject to HOA fines. we loved our stay in watercolor unit 19. what a nice relaxing place. watercolor and seaside were so quaint with all the pastel cottages. we would rent this unit again. We’ve stayed in most areas of both Watercolor and Watersound, and the views, porches, comfort and convenience of this condo is certainly one of the very best. 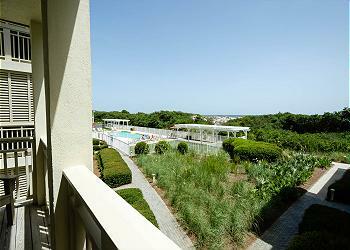 We loved walking to Seaside as well as the heart of Watercolor, the pool and beach without a second thought. I’ll never forget simultaneously watching the Iron Bowl and a spectacular over the water sunset with the family. Btw- Hats off to 360 which detected the microwave wasn’t working before we arrived and brought in a temporary counter model for our stay. We would love to stay here again. We are so glad that you enjoyed your vacation with us in Watercolor! We agree that these condos are amazing and a great place to watch the sunset on the gulf! We are thrilled that your experience with 360 Blue was a positive one! We hope to be able to host you all again very soon! Probably the best unit we have stayed in. 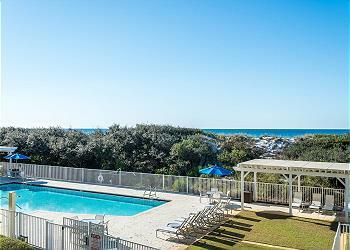 The location and views of Seaside on the East and the Gulf are incredible. We will be back. We are so delighted that you enjoyed your stay with us in Watercolor! We agree that this condo is second to none and the location is spot on! We hope to see you all again very soon! Our annual summer family vacation was great! Two from Denver, two from Orlando and three from Tallahassee. We love the biking and location of Watercolor. Our stay was just no quite long enough! We are so delighted that you enjoyed your vacation with us in Watercolor! The photo you shared is priceless and shows that some wonderful memories have been made! We agree that biking through Watercolor is a great way to site see and get around. We look forward to hosting you all again soon, and hopefully for a longer getaway this time! The perfect spot with a fantactic view! Easy walk to beach and extra towels..Oh and a big plus, CLEAN!! Besides outdated furniture, We have no complaints. We are so happy to hear that you enjoyed your beach getaway in this beautiful home. We loved having you with us and hope to see you back soon! We are very glad to hear how much you enjoyed the location of this condo! We agree it is a wonderful option for a carefree beach getaway! We do apologize for the lack of cleanliness of the condo. We do use third party cleaners and have for some time now but we will be sharing your valuable feedback with our housekeeping team so that this does not occur again. Keep in mind, we can always send back a cleaner should the home be less than perfect! We look forward to seeing you again soon! The condo is lovely - great location in Watercolor. We definitely recommend renting bikes for getting around the area. Our one complaint is the cleaning job was superficial. Shower had hair from previous renter, vacuum cleaner does not work at all or it wasn’t vacuumed as clumps of hair were found in carpet of master bathroom. Potato chips were in the carpet of TV/living room from previous renter. We are so glad you enjoyed your vacation and the condo! We agree this condo is in a perfect location! We apologize for the lack of cleanliness and would like to mention that we can always send out our cleaning crew to fix any issues when you arrive. We also have extra vacuum cleaners we would have been more than happy to bring you. We look forward to seeing you again soon! We loved this condo. It was overall our favorite beach place we’ve ever stayed at as far as location, comfort, view, etc. We will be back but hope the owners make these few updates before we come: 1–new toaster (it does not toast both sides of bread), 2–OVEN (the door does not shut very well and I felt like it was about to fall off at any second. Also racks are cumbersome and hard to move around), 3–water sprayer at sink (there’s a leak and it sprays everywhere when water is turned up high), 4–the lights on the balcony (none of them worked the entire time we were here and we would’ve liked to have eaten outside). The 3 stars for service is due to the fact that 360 was aware of the outside light issue on day 1 and could’ve ordered the appropriate bulbs and had them here in 2 days max. A guy came and switched one bulb from the front balcony to the dining area beachside to pacify us, but the bulb was blown—didn’t work. Otherwise the staff was wonderful and we look forward to our stay in July on Park Row. Such a stunning view! Thank you for the valuable feedback. We are always working to improve our homes and our guests experience. We are looking forward to your visit in July!